Every day was an adventure for her, the fresh new experience, the overabundant of energy, and her childish innocence. Whenever she sees this photo, the past always looks so blazing and beautiful, memories of things that have passed and gone by. A golden memory. I joined this website to share my art journey and to improve my skills. I’m also here to meet nice and chatty people, especially if they're passionate about art. Follow me if you want to be a part of my adventure, or say hi to me on popular Steemit discord servers, I frequent most of them. I am a curator for curie, c-squared, nTopaz, and a moderator in Steem Artists. If you are an artist, join us at Steem Artists discord channel here: https://discord.gg/ENN8KCb :). I really have to get back into drawing again. I know I promised earlier, but life has had other plans. Thanks for uploading the step by step guide. I'm glad if I can motivate you to draw again =). I'm bad with continuation though, so it will all depend on my muse ^^. Ahh, what a beautiful little girl. So nice warm tones. Very very very well done! You create many beautiful shots, so I take this compliment with pleasure. Thank you axeman ^_^!!! She is an adorable character, so I'm glad this drawing turns out well. ohh I love the monochrome, nice touch on adding scrawly on the dress. I didn't notice that until the third glance. I bet this looks better if the there were no adjustments in the resolution during uploads. I'm glad that you looked at this drawing several times until you found my signature XD. And yes, I wish nTopaz doesn't resave art files because all of them look better before they are compressed. The colours also change slightly. Ah well, I'm sure they will get better. I can almost imagine her stepping off a train car pulled by a Steem locomotive (see what I did there? Lol) holding a small suitcase and embarking on a new adventure in a new town. I like the back lighting effect. I hope it's not a Steem locomotive, it might not move very far XD. Hehehe maybe I'm a pessimist. Hehehe I should draw a granny one of these days, I've never drawn them yet XD. But this girl doesn't get old, she's a vampire :). I wish I had the time to really nurture my artistic skills I had way back in High school, squandered too many things and opportunities. Arrrr, it's never too late! When you have free time, pick up some paper and doodle sommit :D.
Actually I have stopped drawing too before I joined Steemit ^^. I wonder what I would look like anime style? Draw and find out :). One of these days I came across what seemed to be a jealous person, claiming that you were posting the same drawings over and over again. He was trying to report you for spam. What the f... is wrong with these people? Keep up with the good art, @scrawly! Clearly they are right. I've been spamming the blockchain daily with my art. Don't worry, they just have to be patient for now but I won't do it forever. And I'm glad that I'm important enough to this person that they must have paid a lot of time and attention to my gallery. Not even my friends spend that much time on me, you know :). Thanks for telling me and for your support, trin XD. I was trying to open your Thriller youtube but it said video unavailable T_T. I don't know this song, but I will find it in youtube and give a listen :D.
Our connection with ourselves at different times in our life is a fascinating theme @scrawly. We remember selectively and forget so much. Old photographs can sometimes trigger the memory of exact moments when a photograph was taken. Not just how we looked in the photograph but how we were feeling at the time. Yes, old memory can be very beautiful and intense. All the feelings come rushing back all at once. Sometimes a song that I've rarely heard can trigger this kind of experience, and it can be quite overwhelming, in a good or sad way, sometimes both. Thank you for your lovely comment, Ally :). Your UA account score is currently 4.454 which ranks you at #2097 across all Steem accounts. In our last Algorithmic Curation Round, consisting of 232 contributions, your post is ranked at #21. I's a very simple yet, I'm really impressed with the skill you have to use different gradients of color brightness to bring such a magnificent artwork. According to our quality standards(1), your publication has reached an score of 89%. Thank you for your support once again Joel and dropahead :D.
And I love painting with monotone because it teaches me a lot about shading and values. Wow! 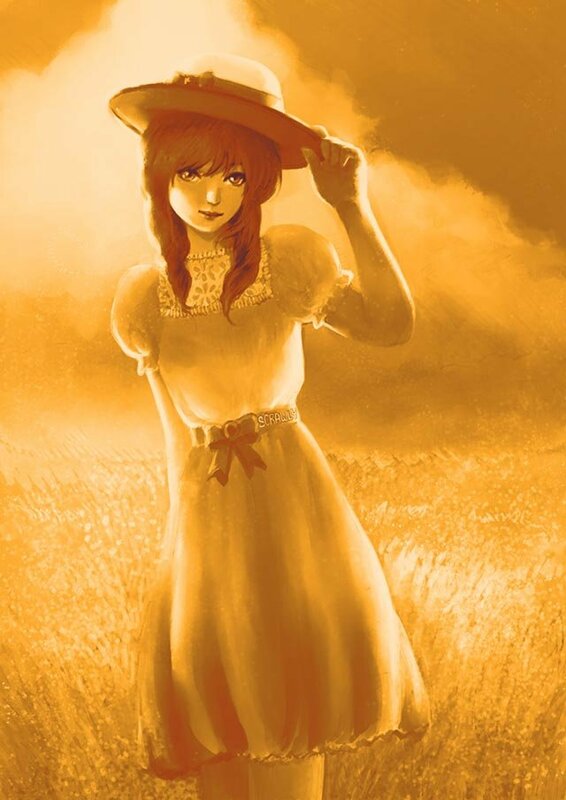 What lovely Golden shades and a lovely girl! I'm so excited! I'm also excited to see your next art! Thank you, my dear Veta ^_^. Thank you very much, inu-jim ^_^. I very like this colors! Beautiful drawing! I also like how it turns out. Thank you :).